Choosing quartz for your home is a great idea! When it comes to home design, there are so many options available to put the finishing touches on your home. In the kitchen, when you’re shopping for countertops, consider these three advantages to choosing quartz. If style is important to you, you’ll find many great options with quartz. If performance is a major factor, you’ll appreciate the durability. Quartz is a manufactured material which allows it to be available in a wide range of colors; much wider than natural stones. Many people have remarked on its gorgeous luster and deep, three-dimensional appearance. For people that enjoy the look of natural stone, it mimics it greatly. This engineered stone comes in rich tones and hues, making it an appealing choice as it is easy to match with many kitchen designs. It’s attractive and provides a unique depth to any design. Quartz countertops have a reputation for being incredibly hard, making them durable and long-lasting in kitchens. In fact, the hardness has been compared to concrete and granite. It’s mostly composed of minerals, including 90 percent ground quartz and 8 to 10 percent resins, polymers, and pigments. It is also quite resistant to chipping and cracks. 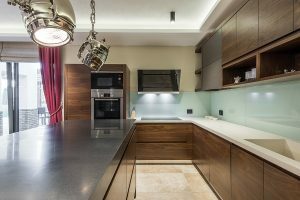 Although you should still use cutting boards and take other necessary precautions to preserve your quartz countertops, it will be able to withstand many years of use as your main work surface in the kitchen. Quartz is an engineered material, making it much more predictable to work with than granite and other natural stones. It’s nonporous and therefore resists staining much better than any of the other available natural stones. Because the cuts can be customized to each order, there is also a much less chance that you’ll have to deal with unsightly seams. Quartz is incredibly easy to clean with a non-abrasive and non-bleach household cleaner and a soft sponge. Don’t allow stains and other debris to build up by simply wiping the surface clean after each use. This entry was posted on Friday, January 26th, 2018 at 5:10 pm. Both comments and pings are currently closed.